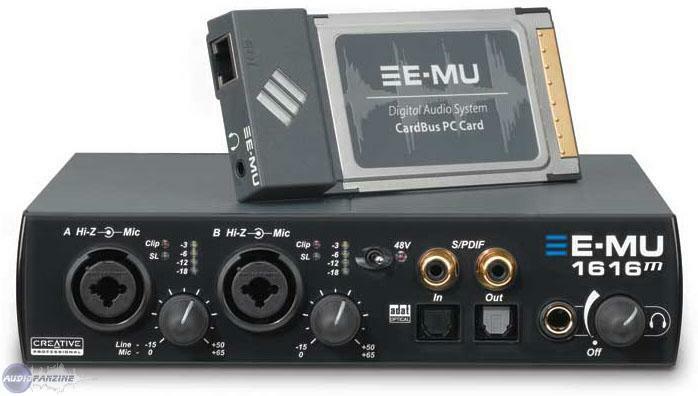 1616M, PCMCIA Soundcard from E-MU. Wish it had second seperate headphone output. The PCMIA card was supposed to light up blue like the box does but they deaded that right before they put it on the shelf,some kind of interference problems so they left it out. Cat5 cable is bulky and only 3 meters long though an optional 10 meter one can be bought through EMU. Wish the inerface box was bus powered. Built in turntable pre is cool. Slight learning curve. Good manual. The DSP takes some strain off of your computer processor.Everybody complains about Patchmix but I actually like it. You can set up your own custom effect routings, session presets and trade with fellow EMU heads. Customer service is decent. The productionforums.com site will help you out if you don't understand something. Comes with a good sequencer/startup package also. PCMIA card is just that,be careful with it. Comes with a nice carrying case for the card. The interface box seems to be nice and sturdy. Both fit nice in M-AUDIO mobile studio backpack. 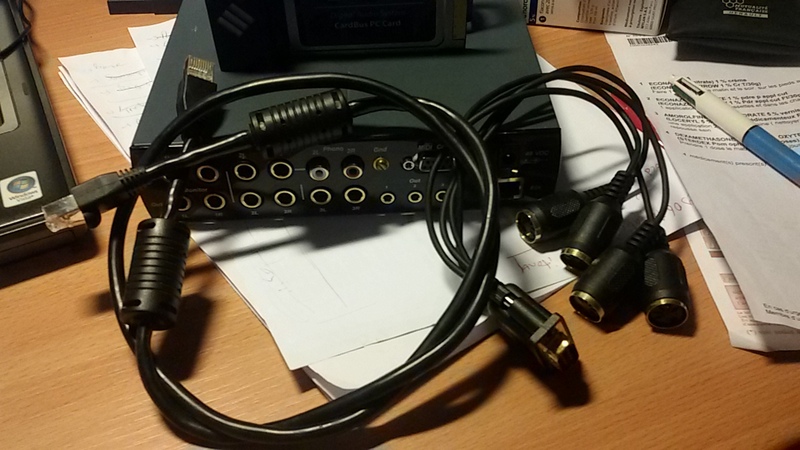 Pro Tools DAC you know. Pristine. Nice preamps too. Hasn't failed me yet. Loves me and I love it back. 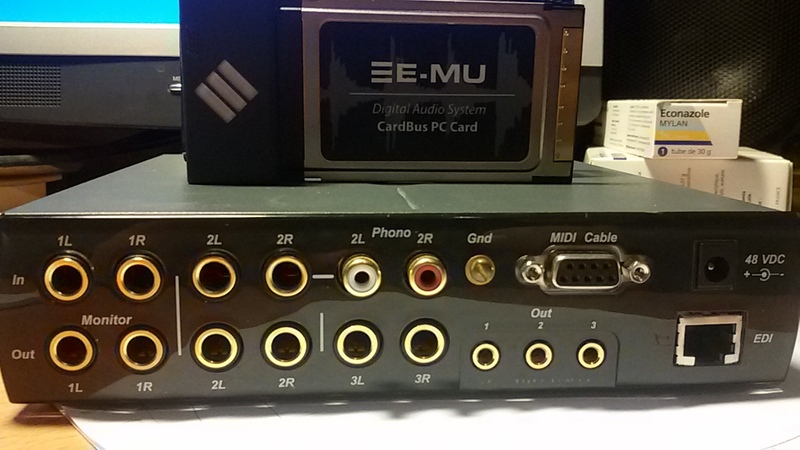 EMU has a tradiion of quality products. The rep proceeds. Now where can I get A SP1200 for cheap????? I have this card recently, I give my opinion anyway (although I have not been around 100%) for spontaneous info! I will publish can be later! I wear my choice on this model because of the adat, the preamps hq, and port pcmcia in which I have more confidence that the fw. with more means I would have opted for the traveler, at a minimum, although fw; in this price range, the 1616m was the logical choice to my current needs. 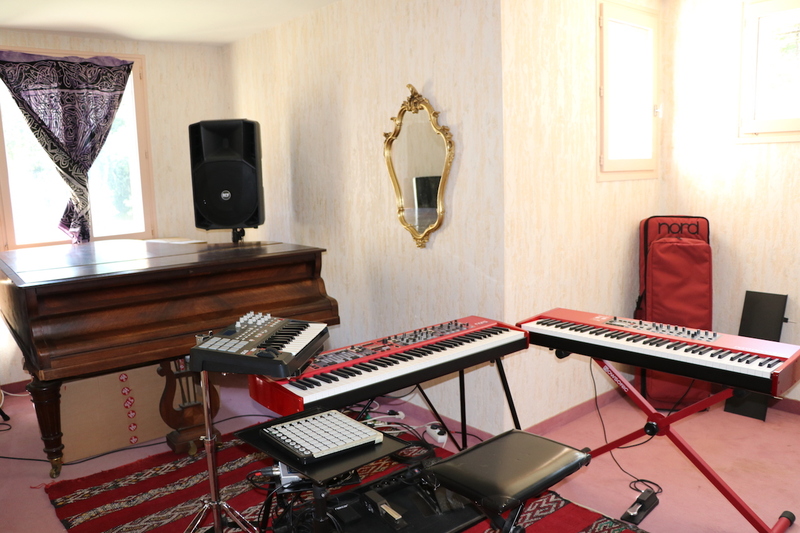 Use pro, taken lives and large home studio. CAT5 cable a little short on well. Install on Sony VAIO VGN a-115b, 1g ram, xp pro, AC works nickel. I moved naturally, no problem, no really! AC was working on nickel! No worries far config relatively easy once you freelance software patch. Manual paper a little short on the most comprehensive cd. Not enough perspective to the stability of the whole ... but a priori AC works well. I'm not looking to beat records with latency, I am 50 (default) for now, it will run seamlessly with 14 in (2 XLR, 4 year, 8 adat), 2 out (I mix more often on the computer, so I just 2Track). I only audio, no noon. I've had three days (! 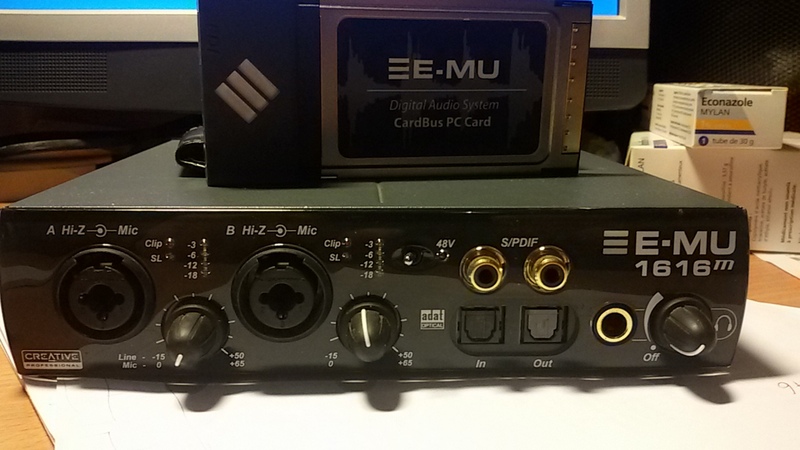 ), And BIG advantage is of course the quality of the preamps and converters. When we come out of the 2408 motu (in my case) is actually obvious, and even stunning! high dynamic, large definition, punch! just for ca it's worth it! Lack of light on the rack as my taste, forces always have the PatchMix a mouse scope to see the meters. pretty embarrassing ca. I remake a post a few months. I bought it three months ago. Plastic EDI connector of the PCMCIA card has exploded. I sent in for repair, they will replace the card, DLAI 7 to 10 days. Everything is already said. Note that it works with a PCI PCMCIA adapter. 6 among which 2 analog mic / line / instrument. ADAT and SPDIF. Optional worldclock. The DSP allows the singer to get along with effects (reverb ...) without saving. The routing is very powerful, you just understand. The sound seems to me A / B comparison much better than that of the Fireface 400 (these are just my tastes ... but it's obvious to me). The pramps are very good for the built-but rather is used with external pramps good. Nevertheless their rsulat is very clean and usable. This is the top level that price. 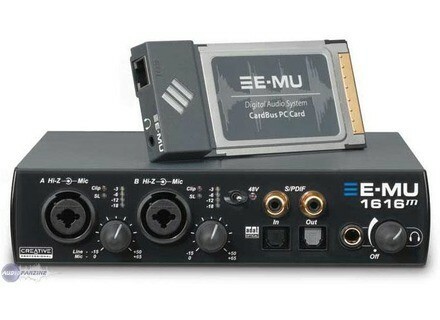 For me the only interface to the pro that price I (and above).